BFFS Reunite for Raunchy Bachelorette Party Reminiscent of "The Hangover"
Jessica (Scarlett Johansson) and Peter (Paul W. Downs) are on the verge of tying the knot. But prior to walking down the aisle together, they've agreed to simultaneously throw themselves bachelor's and bachelorette's parties. But while she flies down to Miami for a swinging soiree' with a quartet of her closest college classmates, his relatively-modest plan is merely to share a refined evening of wine tasting with a few a nerdy buddies. Since Jess is also in the midst of a campaign for the state senate, she doesn't want their reunion to get so out of control as to generate the sort of negative press that might hurt her candidacy. However, she's blissfully unaware that decorum is the last thing on the mind of Alice (Jillian Bell), the girlfriend entrusted with scheduling their agenda. Alice sees the getaway as an opportunity for the BFFs to indulge one last time in the sort of depravity they enjoyed on campus a decade ago, when they would get wasted playing beer pong on a typical Friday night. Consequently, she's prepared for a wild weekend which includes everything from cocaine to a male stripper. Such activities might not sit well with another attendee, Frankie (Ilana Glazer). After all, she's not only a lesbian, but a repeat offender worried about violating the "Three Strikes" law mandating a life sentence. However, pal Pippa (Kate McKinnon), a clown returning from Australia for a good time, is up for anything, as is overstressed Blair (Zoe Kravitz) who needs to decompress from an ugly custody battle. The plot thickens soon after the exotic dancer Alice hired rings the doorbell. Before he has a chance to shed all of his clothes, he accidentally hits his head and promptly passes away. Against their better judgment, Jessica and company decide to dump the body in the ocean rather than call the cops. And what ensues is a relentlessly-hilarious, ever-escalating comedy of errors. Thus unfolds Rough Night, a raunchy romp most reminiscent of The Hangover (2009), although it also has moments likely to remind you of Bridesmaids (2011) and Weekend at Bernie's (1989). 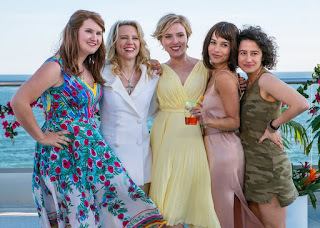 The movie marks the phenomenal directorial debut of Lucia Aniello, the first woman to direct an R-rated comedy since Tamra Davis made Half Baked in 1998 with Dave Chappelle. Laughs galore in a bawdy bachelorette party gone from bad to worst!